The National Transport Authority introduced the cap, and plans to roll it out for Irish Rail and Dublin Bus in the near future. IF YOU ARE a regular Luas user, you might be glad to hear that a cap has been put on the amount you can spend while using your Leap card on one day. The National Transport Authority introduced the cap the week before Christmas, but it flew somewhat under the radar. They plan to advertise it over the coming months, spokesperson Sarah Morris said. Morris told TheJournal.ie that when the cap was first put in place, it was still cheaper to buy a Luas day ticket, but once Luas prices went up on Monday 7 January for the annual fare increase, the cap became cheaper. The cap automatically comes into play once you reach €6.40 on one day, so the Leap card user isn’t required to do anything other than tag on and off as usual. “It has been quite successful,” said Morris. We believe about 100 people a day are benefiting from it. We will probably be doing some kind of a small ad campaign soon to tell people about it. The next stage in the development of an integrated smart card is to introduce a daily spend cap for Leap cards used on Irish Rail and Dublin Bus. Testing is ongoing at the moment for these. It is hoped to launch a daily cap for Irish Rail in a matter of weeks. Eventually, the service will be fully integrated. “We’re live-testing a load of things at the moment,” said Morris. It is also envisaged that private operators would be invited to enable Leap cards to be used on their vehicles. 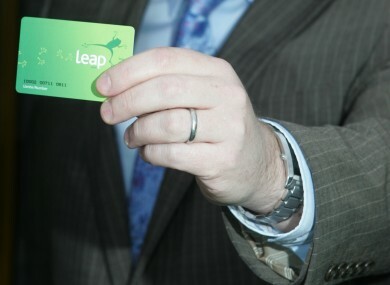 Email “Leap card: Daily Luas spend capped, and auto-top-up on the way”. Feedback on “Leap card: Daily Luas spend capped, and auto-top-up on the way”.